Ahwazi Arab political activist Jamil Sowaidi became the eighth Ahwazi Arab political prisoner to die under interrogation so far this year. Revolutionary Guards took the 47-year-old welder from his home and informed his family earlier this month that he had died, although his body was not released to them. He had never been charged with any crime. Although his family were warned not to pursue the matter, they have struggled to confirm details of when or where he died. Officials at Sepidar Prison in Ahwaz claimed that no-one with his name had ever been admitted. The Revolutionary Guards are known to operate detention centres outside the official prison system where they conduct interrogations using torture. Sowaidi is the eighth person to be killed under interrogation this year. 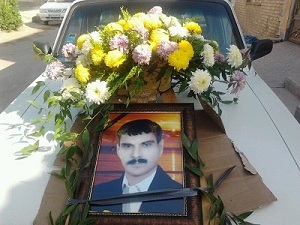 Abbas Sawari, arrested in April 2011, whose body found washed up on the shore of the River Karoon in September. Alireza Ghobaishawi, 37 years old from Khalafiya (Khalafabad), was killed while in detention in August. Other Ahwazi detainees killed under torture are Ghaiban Obaidawi from Hamidiyah, Mohammad Cheldawi from Ahwaz, Reza Maghamesi from Dezful, Mohammad Kaabi from Susa and Nasser Alboshokeh from Ahwaz. Extrajudicial killings of Ahwazi Arabs are at least as frequent as official executions of political prisoners. The killings come amid a massive clamp-down on Arab activist and any sign of dissent in response to the uprisings elsewhere in the Middle East and North Africa. The Iranian regime is particularly anxious about the influence of a Syrian revolution on the indigenous Arab community as the Syrian opposition openly states its support for the Ahwazi cause.